Geo Tracker + Ford 5.0 V8 =..? 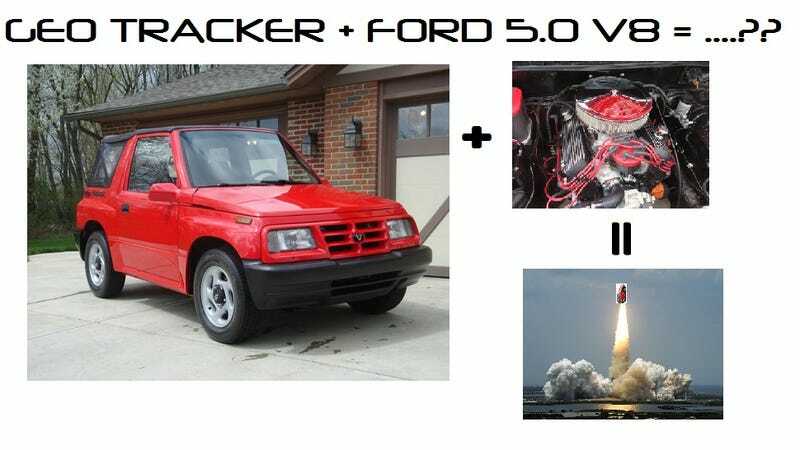 There is an old saying that "any car is better with a V8," but cramming a Ford 5.0 V8 into a Geo Tracker pushes the envelope of sanity. Join the DailyTurismo as we explore the final frontier with this ultimate Geo Cobra sleeper. The Geo Tracker (Suzuki Sidekick) was a small SUV built in a Canadian factory as a joint venture between GM and Suzuki. The Tracker was actually built on a rugged truck frame and certified as a light truck but let down by an anemic 1.6 liter 4-cylinder engine. At least one enterprising hot rodder decided that a Ford 5.0 V8 will fit between the fenders and created a serious sleeper. Find this 1996 Geo Tracker w/Ford 5.0 V8 swap in Newark, OH offered via ebay for $14,500 buy-it-now or best offer. This Tracker is powered by a Ford 5.0 liter V8 that has been massaged with a number of aftermarket parts including the common Ford Motorsports B303 cam - which properly matched to a high compression engine, with free-flowing intake/exhaust will make something like 350 horsepower. The inside looks similarly nice in condition compared to the exterior, except for the addition of an aftermarket steering wheel and shifter. It is always a risk to buy someone else's project car, but with any luck this one has been properly built and debugged, and you can enjoy the fruits of the previous owner's labor. Just hope that fruit isn't a lemon. Either way, the pucker factor will be high with this potent little squirt. Thanks to tip from Scot.